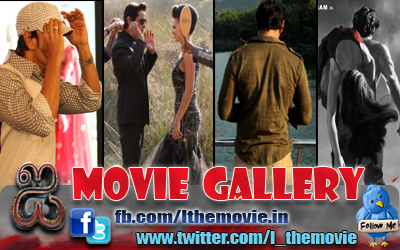 Home » Latest Buzz » G.V. Prakash to croon for Vikram's next flick Deiva Thirumagan! G.V. 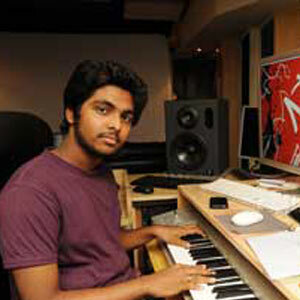 Prakash to croon for Vikram's next flick Deiva Thirumagan! G.V. 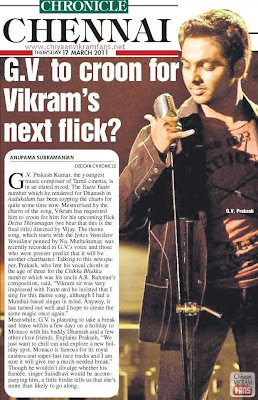 Prakash to croon for Vikram's next flick! G .V. Prakash Kumar, the youngest music composer of Tamil cinema, is in an elated mood. The Yaate Yaate number which he rendered for Dhanush in Aadukalam has been topping the charts for quite some time now. Mesmerised by the charm of the song, Vikram has requested him to croon for him for his upcoming flick Deiva Thirumagan (we hear that this is the final title) directed by Vijay. The theme song, which starts with the lyrics Vennilave Vennilave penned by Na. Muthukumar, was recently recorded in G.V. 's voice and those who were present predict that it will be another chartbuster. Talking to this newspaper, Prakash, who lent his vocal chords at the age of three for the Chikku Bhukku number which was his uncle A.R. Rahman's composition, said, "Vikram sir was very impressed with Yaate and he insisted that I sing for this theme song, although I had a Mumbai-based singer in mind. Anyway, it has turned out well and I hope to create the same magic once again."